BeNaughty is definitely the website for lesbian singles looking for some no-strings-attached all woman action. If you are hoping to find the life partner of your dreams, then you may be better off at CompatiblePartners or a similar site. However, if you are searching for hot action or a quick hookup, then BeNaughty dating has all the tools you need. There are plenty of opportunities to get in touch with other users and while you are browsing for the perfect match, you will have access to a whole range of useful content to keep you busy. And although it is packed with features, BeNaughty is also extremely simple to use. Although a typical lesbian BeNaughty review might emphasize that this is a site for adventurous, single-minded users, it is important not to overlook that it is also designed to give members genuine control over how they use the site. For example, there are numerous ways to get in touch with other members. You can use the standard private message, instant chat or flirt features. However, if you are feeling bold, why not try video chat instead? On the other hand, more cautious users might want to try the anonymous SMS tool. Beyond communication, there are plenty of features at your disposal, including blogs, forums and chat rooms. You can also send another member a virtual gift or participate in a saucy photo contest. However, perhaps the most impressive BeNaughty website feature is the “Naughty Mode," which allows you to choose exactly how risqué you want the site content to be. The sign up process is very straightforward and certainly no more time-consuming than the likes of Zoosk. The most important factor though is that you will be asked both your gender and the gender of the match you wish to find. This means that you will only receive suggestions for other lesbian users also looking for a good time. You will be asked to provide some other basic details, including date of birth, location, e-mail address and password. You will then be required to wait a few minutes to receive a verification e-mail. Once you click on the relevant link within the message, you will be given the chance to tell other users a little more about what you’re thinking, which is a great chance to describe exactly what you want. Users also have the option of submitting additional information, such as appearance, weight, height, eye and hair color, plus ethnicity. For a start, BeNaughty won’t share your personal details with third parties. Meanwhile, there is also advanced encryption technology, which keeps transactions and personal information away from prying eyes. On sign-up, users must verify their account by e-mail, which helps guard against scammers. In addition, the safety guide is worth reviewing for both online and offline dating. Free members enjoy limited use of the site, but can at least explore the various options. If you want a taster of full usability, then try the 3-day trial for $2.84. In fact, if you want unlimited ability to message, flirt and maximize your chances of finding a match, then you will need a paid package. 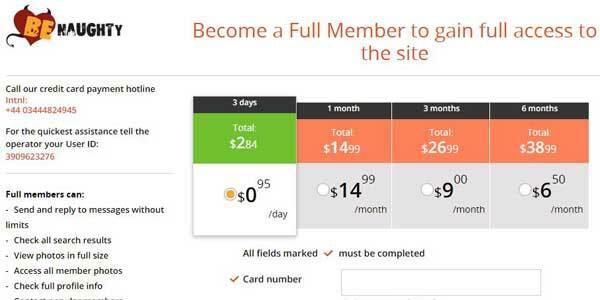 A 1-month deal costs $14.99, a 3-month package just $9.99 monthly and a 6-month deal only $6.50 each month. The site is incredibly straightforward to use from the moment you hit the BeNaughty login. You will be taken straight to your personal dashboard, from where you have direct access to pretty much everything you need. Automatically, you will be presented with a range of suggested matches, based on the information in your profile. Talking of profiles, if you see one which catches your eye, you will discover plenty of information about them at just a quick glance. And if you want to then get in touch with them, there is a message and wink button at your convenience. In short, finding and then contacting someone is made incredibly simple. Conveniently, the site also displays a list of members online, ready to chat. In addition, there is a mobile app to keep you in touch while you are on the go. For a start, BeNaughty will automatically suggest matches. However, if you want to be more proactive about your search, then you will find a quick and efficient search function. If you have ever used the likes of match.com, you will be familiar with the basic search, which enables you to find someone based on age and location. However, the advanced search provides a more comprehensive range of criteria, including some that you won’t find on a regular dating site. In addition to fields such as religion and education, you can also find a match based on detailed physical attributes such as piercings. Uniquely perhaps, you can also search via photo quality too! This is not a dedicated site for lesbian daters. Nonetheless, BeNaughty is constructed so impressively that it makes it simple to find a like-minded, lesbian lover. The sign-in itself ensures that you will only be matched with a lesbian single, while the exhaustive search options help you to narrow down your quest. Meanwhile, you can further specify what you are looking for within your profile. There is only one possible conclusion to this lesbian BeNaughty review – This is an excellent value site for lesbian singles looking for fun with no commitment. You will find other users searching for the same thing with relative ease and the site is a pleasure to use. Check it out and have fun! Read our main BeNaughty Review.